We’ve been hankering to try it out another Kanto branch ever since visiting the Kanto Freestyle Breakfast in Mandaluyong some months back. Even though our eyes went white while waiting for our orders to arrive, we were pretty much satisfied with the food we had then. With nothing to do one weekend, we decided to drive out to Libis and check out the Kanto Breakfast in the area. Going there was easy enough since their Facebook Fan Page provided a map customers can use to find the restaurant; err, carinderia, as they claim it to be. Pardon the grainy photos as I didn’t have my camera with me at the time and had to make do with my cellphone. 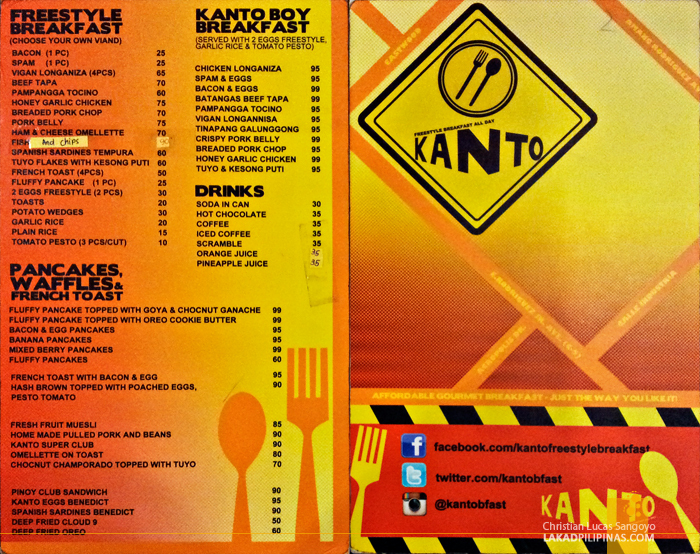 One can easily miss the Kanto Freestyle Breakfast branch in Libis if you plan to head there without proper research. The resto is tucked inside a compound of restaurants and what-nots and is not visible from Libis C5 road. Better check their map here if you’re going there for the first time. The first thing that struck me upon alighting from the car was its location. As its name suggest, I was expecting it to be located on some ordinary street corner and not along a complex of restaurants and bars. The second thing was this particular branch of Kanto Breakfast is enclosed and air-conditioned. A far cry from the legit atmosphere of the Kanto Freestyle Breakfast in Mandaluyong City. To be fair, they still tried to incorporate a street atmosphere to the restaurant (alright, I’m now calling it a proper restaurant); utilizing street lamps and simple wooden furnishings usually found on carinderias. But still, I cannot help but feel it to be a totally different resto from the one we tried before. I checked their menu and found their prices to be almost the same as their Mandaluyong counterpart. Their Kanto Boy Breakfast fares cost Php5.00 higher at Php95.00 per meal (inclusive of two small eggs, a cup of garlic rice and tomato pesto). But I’m not really sure if they have raised their prices now or it’s just really more expensive at their Libis branch; well, it is air-conditioned and located at a commercial building. Anyhoo, we proceeded with our orders, five-peso increase notwithstanding. Our order list consisted of Honey Garlic Chicken (Php99.00), Crispy Pork Belly (Php99.00), Batangas Beef Tapa (Php99.00), Tuyo and Kesong Puti (Php95.00). For desserts, we asked for Deep Fried Oreo (Php60.00), Mixed Berry Pancakes (Php99.00) and the classic Filipino street fare, the Scramble (Php35.00). With that out of the way, let’s dig in. The first to arrive was the Scramble. One look at it and you can easily tell that this should’ve been served as part of their desserts. The only semblance that I can see of a classic scramble is the pink crushed iced in its midst. Besides that, it is a cacophony of everything sweet. It looked awesome. The taste? It still has that scramble taste, feel and texture. Only more! Goodstuff. Then platefuls Kanto Freestyle silogs came rushing in (well, technically not silogs since the rice isn’t fried). Our table which is actually good for four persons was filled to brimming, we had to move the desserts to another table. I ordered their Crispy Pork Belly. I found the pork to be bland in itself, so the Mang Tomas sauce that’s served with it is a must. It was crispy, but that’s all there was to it. Pretty ordinary. I also got to try Kanto Breakfast’s Tuyo and Kesong Puti which I found to be ordinary tasting as well. But take note that I’m not really a big fan of kesong puti, so might as well try it out yourself. Serving size is a bit small, in my opinion, but my companion said that it was more than enough for the cup of rice. Our Kanto Boy plates disappeared and was soon replaced by dishes of sweet desserts. The Fried Oreo, which I hear a lot about, was pretty good. It’s not as sweet or as oily as I thought it would be. I didn’t get to try the Mixed Berry Pancakes since it disappeared too quickly from our table. If that’s an indication of how it fares, it must be excellent then. Our Kanto Freestyle Breakfast experience in Libis is a somewhat iffy affair. The food, which is more expensive by a few pesos, is the same; but the experience and ambience is totally different. That open-aired kanto experience complete with car fumes and fly-swatting action is nowhere to be found here. Without those, the whole street-style experience seemed to have vanished, making the Libis branch of Kanto Breakfast nothing more than an ordinary restaurant lined along a host of other restaurants. I heard more about this pero hindi ko pa na-try. :) anong masarap sa kanila? Overpriced. Dwarf Sized Serving. And so darn slow! Ang bagal ng service nyo! Ang rude pa ng crew nyo. Hindi namamansin. A glass of water would take 10 mins? Yung simpleng egg serving nyo inaabot ng 30 minutes? Sobra. Nagkaron pa ng diarrhea yung kasama ko dahil sa scramble nyo! Correct. Serving is for an 8-year old. And not well-ventilated. That's in Boni branch.